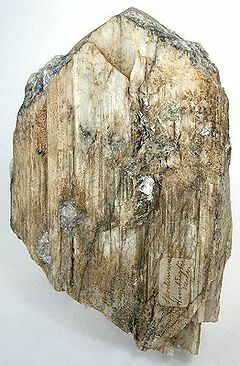 Spodumene is a lithium-bearing pyroxene, lithium aluminum silicate (LiAlSi2O6). It is a major lithium ore found in pegmatites, forming clear monoclinic system crystals or masses. It is opaque or transparent in many hues, and the transparent lilac and green varieties are used as gems. Hardness 6.5–7; relative density 3.2.